The Sweet Sixteen Waterfall is found in Sundarijal in Nepal. Sundarijal stands for beautiful water. During monsoon this waterfall turns all the more gorgeous. It is said that everything does not look nice when it falls but this amazing waterfall looks scintillating when it falls from a height down below. The water dances from the top and splashes down gracefully. The scenery near the waterfall also mesmerizes the onlookers. Its beauty is captivating and a must see destination for all. Adventure sport like canyoning in this waterfall is raw and a must try event. 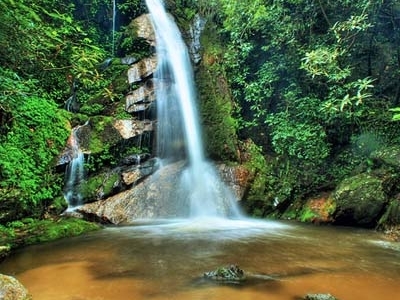 Here's the our members favorite photos of "Waterfalls in Shivapuri Nagarjun National Park". Upload your photo of Sweet Sixteen Waterfall! Get in touch with 2 Touristlink members who want to visit Sweet Sixteen Waterfall or with Liberty Holidays, German Pablo and 6 others who already have been here.